Carryings On Up The Dale: The Battle of Leuthen - an excellent and demanding game! 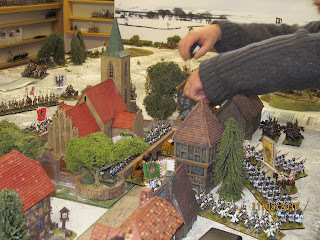 The Battle of Leuthen - an excellent and demanding game! As stated in an earlier post, this week's game was another go at Leuthen. It's not my favourite Seven Years War battle and we've already done it twice in the last 12 months, but we were using Black Powder. This time we were to use Honours of War, our now much preferred ruleset for the period. It also meant I could strip my table back to reveal my roofing felt snow terrain and use my new winter backboard. (Quite apt as, living as I do in the North Pennines, there really was snow on the hilltops outside). Robbie, Robbie's nasty cold which I think he left for me to catch, John, Dave Jarvis with some hand-baked cupcakes, and Mark Dudley http://ilkleyoldschool.blogspot.co.uk joined me for the game. Robbie and Mark took the Austrians, I had the Reichsarmee with added catering responsibilities, and John and Dave were Prussians. Robbie was Charles of Lorraine and it was John's turn to be Frederick. 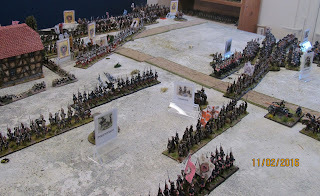 The orders of battle were largely derived from those use in my last refights, which in turn were based on the scenario described in Charles S. Grant's Wargaming in History and piles of other stuff I have on the subject. We're doing the final phase of the battle, i.e. 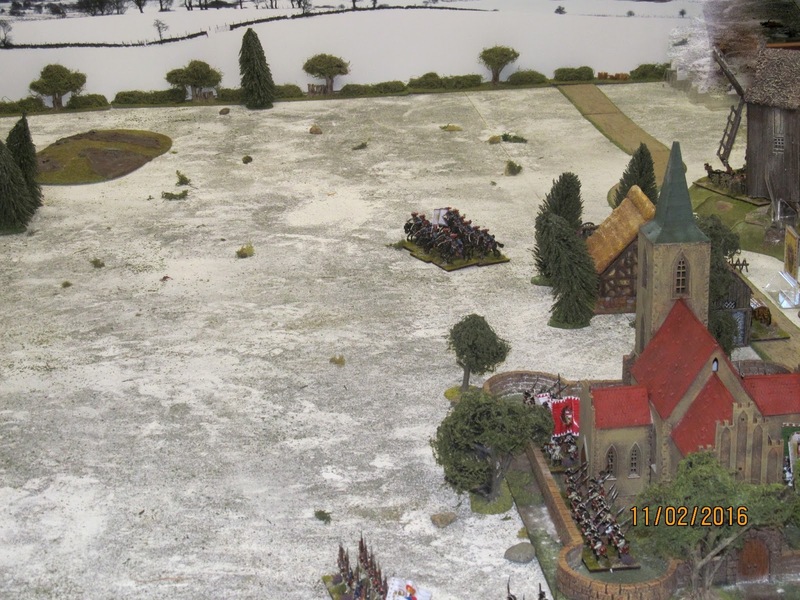 the Prussians have already rolled up the Austrian left flank and are heading towards Leuthen while the Austrians are desperately trying to redeploy their line around Leuthen. Map from Kronoskaf. 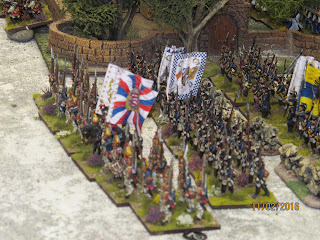 Right wing reserve: GM Herzog von Arenberg DEPENDABLE in column behind Leuthen. Left Wing Cavalry: off table SW short edge and enters after the right wing Austrian cavalry have exposed their flank, come within 30cm of Butterberg, or T5 on roll of 6 on 1D6 (+1 for each subsequent turn). The start of the battle. 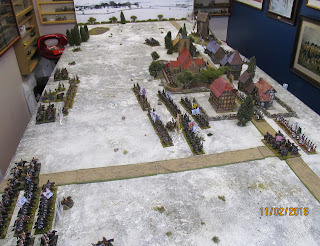 The Austrians are desperately trying to realign their army to face the Prussians while the Reichsarmee (representing the Bavarian and Wurttemberg divisions) in the centre of the table are retreating rapidly after being bundled out of their positions somewhere off table to the left. 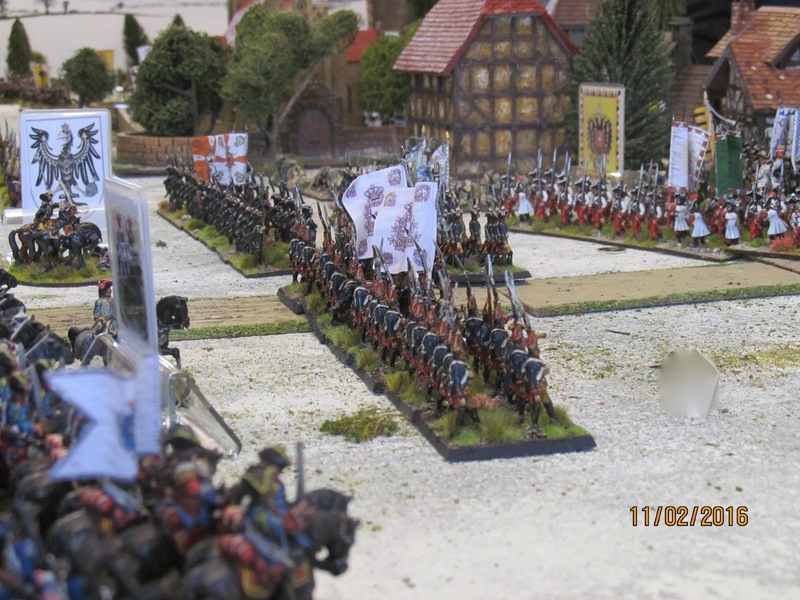 A lone Austrian hussar regiment on their right flank. Leuthen church held by the Rot Wurzberg regiment. The Reichsarmee streaming past them seeking safety in the houses of Leuthen. Mark asked if he could put some of his troops on the table so a squadron of never before blooded Saxon hussars were attached to the Austrian Palatinal Hussars. 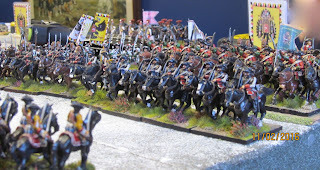 The combined unit acted as an admirable and colourful speed bump in the face of the Prussian cuirassiers. 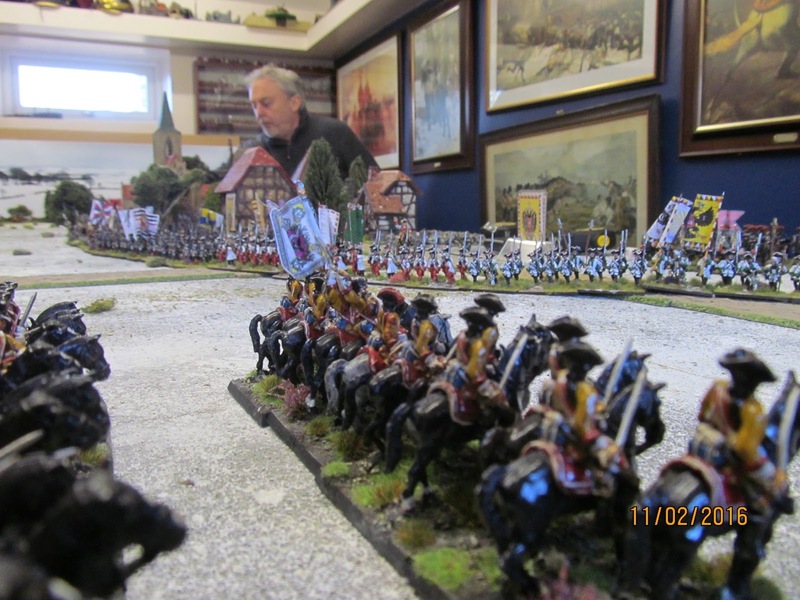 Robbie looking pensively at the open Prussian flank and wondering when their reinforcements would arrive, while the Austrian left tries to shake out into line to face the Prussian cuirassiers heading their way. The Reichs contingent continues to evaporate, with the notable exception of the Hessen-Darmstadt Leib-Grenadiers (left). 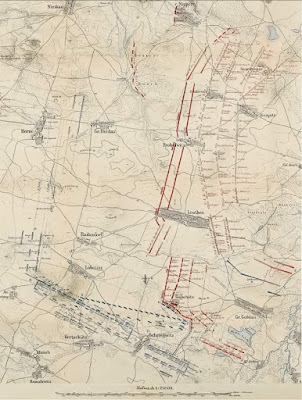 The other battalions were being pounded by Prussian 12pdrs and encouraged to keep retreating. 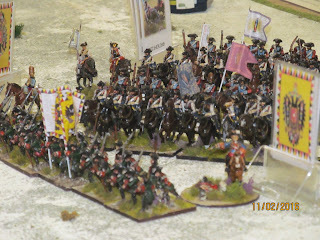 At last Mark is able to bring on Serbellini's cavalry, who did a fabulous job halting the Prussians and even driving them back. 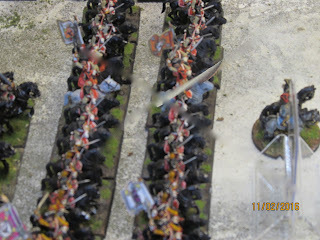 Dave had managed to create a bit of a traffic jam with his cavalry leaving them no room to manoeuvre if they had to retreat, which several regiments did! 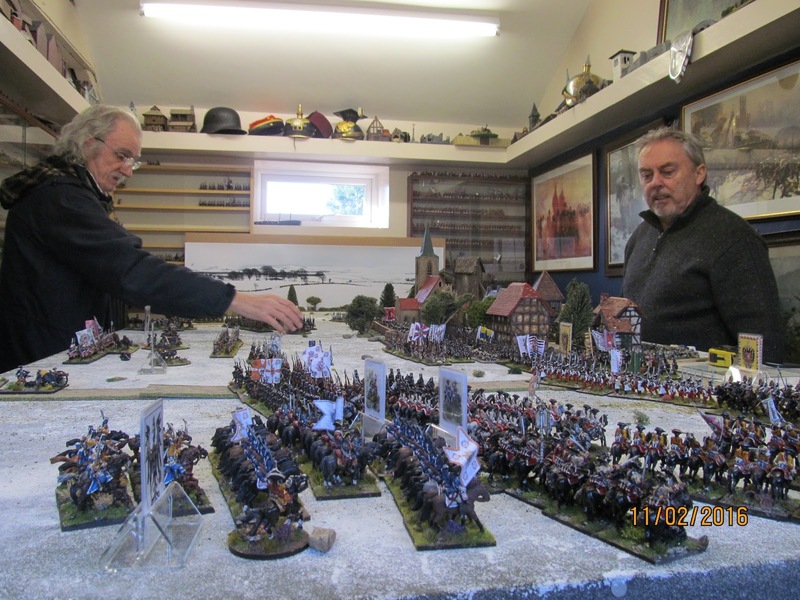 All the action was taking place on the Prussian left, but John was also advancing with the Prussian main body towards the Austrian centre, while Dave's infantry can be seen deploying behind the cuirassiers. Robbie, as Charles of Lorraine, looks on, powerless at this point to intervene and stem the Prussian advance. 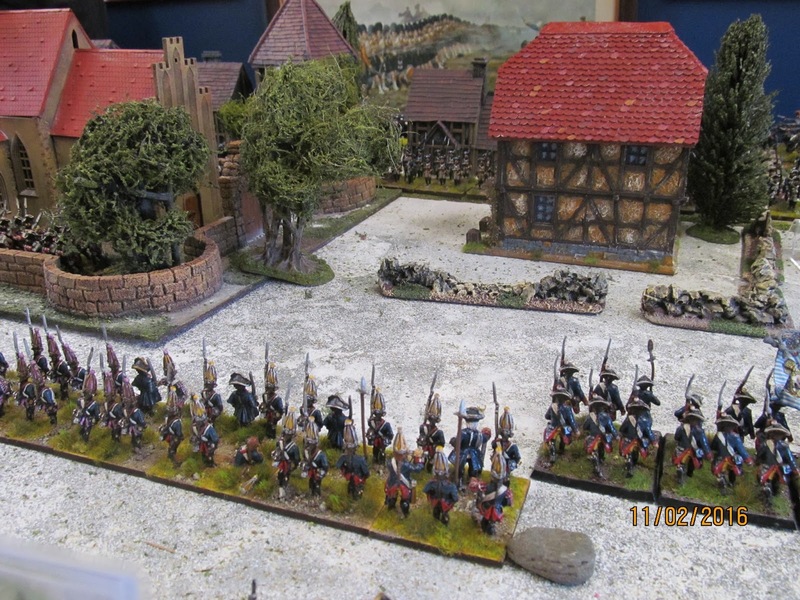 The Hessen-Darmstadt Leib-Grenadiers still covering their comrades' withdrawal into the town. 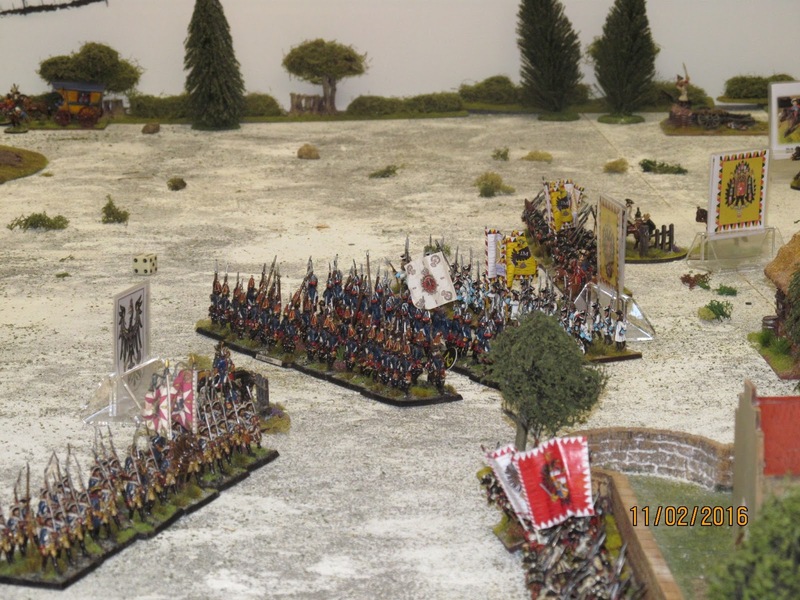 Dave launched his cavalry at an exposed battalion of Hungarian infantry. Predictably they were beaten off and forced to withdraw. 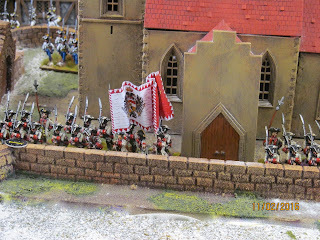 Mark inexplicably decided that the Rot-Wurzberg regiment should leave the safety of the churchyard and advance. 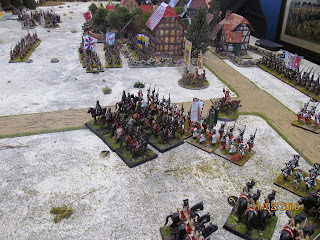 In the background Robbie's Austrians were just about holding their own against the Prussian advance. 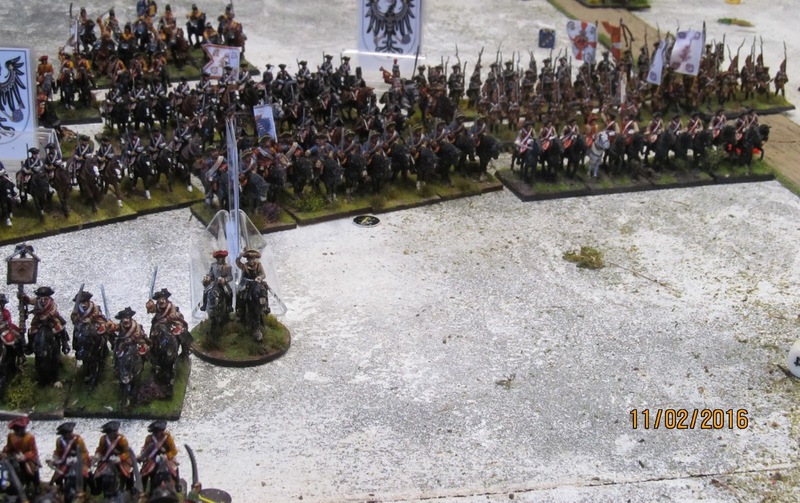 The Prussian right still looking menacing after its first clash with the Austrians. Robbie's reinforcements streaming into Leuthen. Or dribbling? Rot-Wurzberg about to retire back into the churchyard. 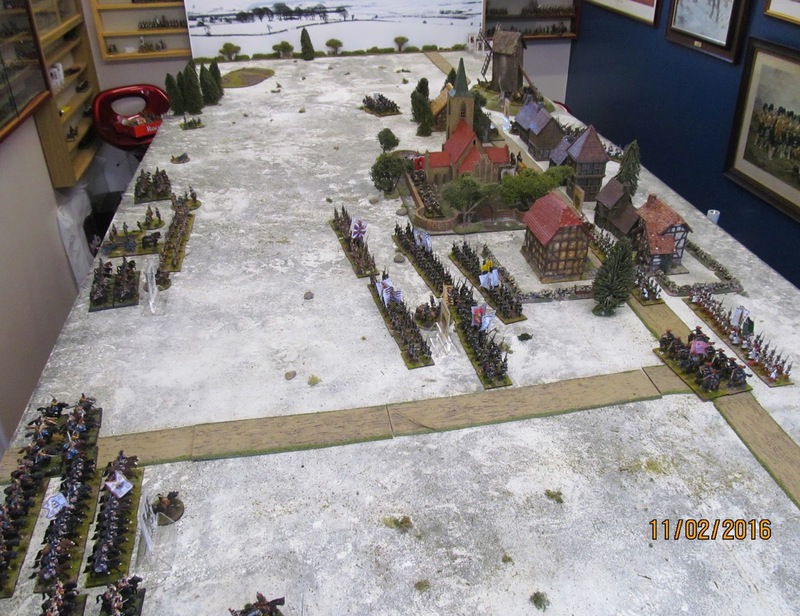 A rather large gap previously occupied by the now disintegrated Reichsarmee corps. The Austrian left flank from the Prussian perspective. 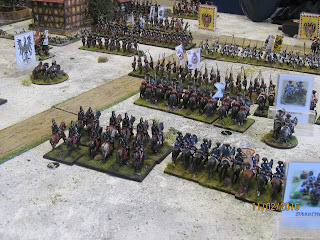 Serbelloni's cavalry are on the baseline and O'Donnel's dragoons are not far behind them. Safely back in the church -Rot Wurzberg. Robbie's right wing cavalry under Lucchesi and Esterhazy make an appearance - ultimately eight regiments of cuirassiers and dragoons facing very little at this stage except Moller's artillery and the flank of John's infantry. 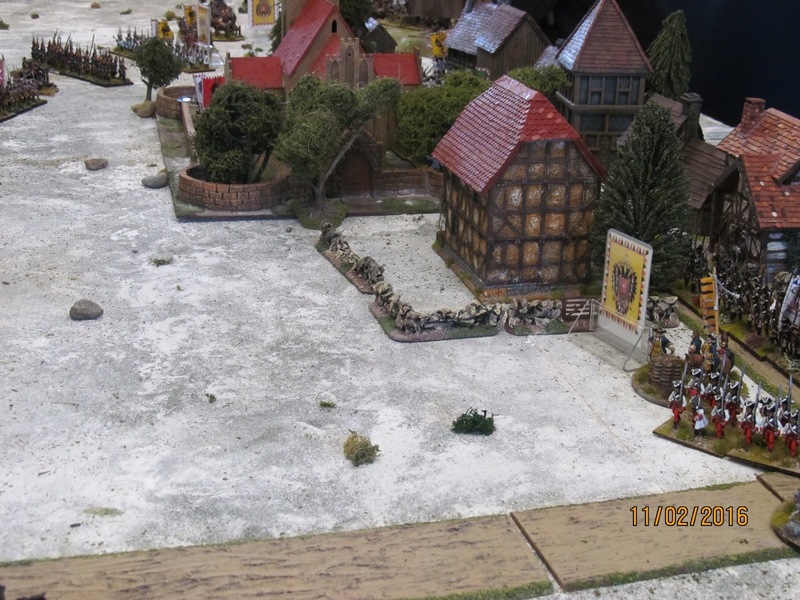 Dave's Prussians have now swept the Reichsarmee from the field and are poised to advance on the town. The Prussian IR6 Garde, advance, with IR16 Graf zu Dohna on their flank. The cavalry battle on the Austrian left has ground to an inconclusive halt, both sides having pulled back to lick their wounds and reform. 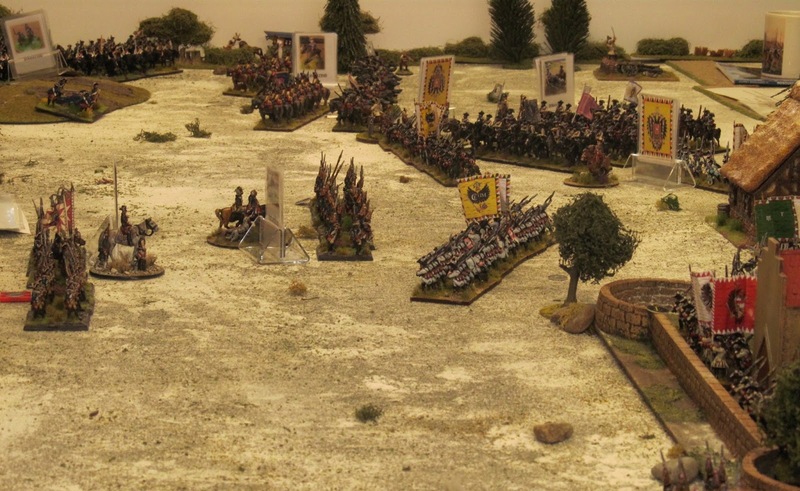 This left just two infantry regiments to withstand the Prussian advance. The Austrian right, Dreisen's Prussian cavalry have just appeared on the flank of the Austrian cuirassiers. Prussian dragoons and hussars reforming behind their infantry. 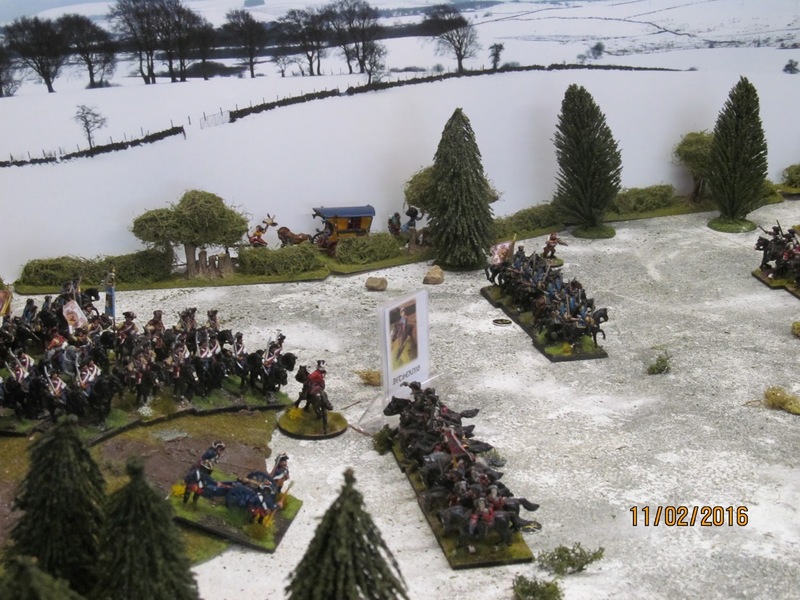 Robbie tried to charge Moller's artillery with his cuirassiers, without success. His cuirassiers and the Prussians lock sabres in the background. GL Lucchesi (left/centre in cuirassier uniform next to the cuirassier with the flag) just before a cannon ball took off his head. 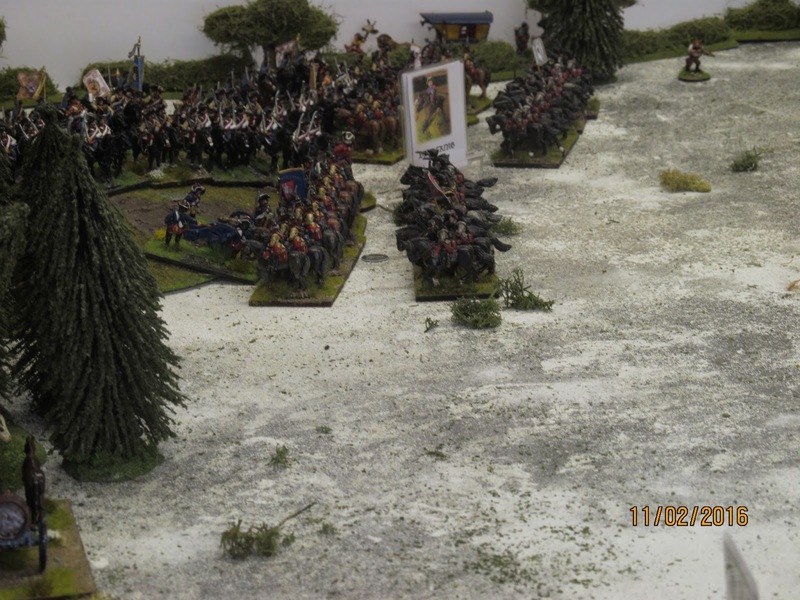 GM Esterhazy was to meet a similar fate in the same turn. When Robbie re-rolled to see what the quality of their replacements were, he threw two 1's so both became 'Dithering', a big drop from 'Dashing!" 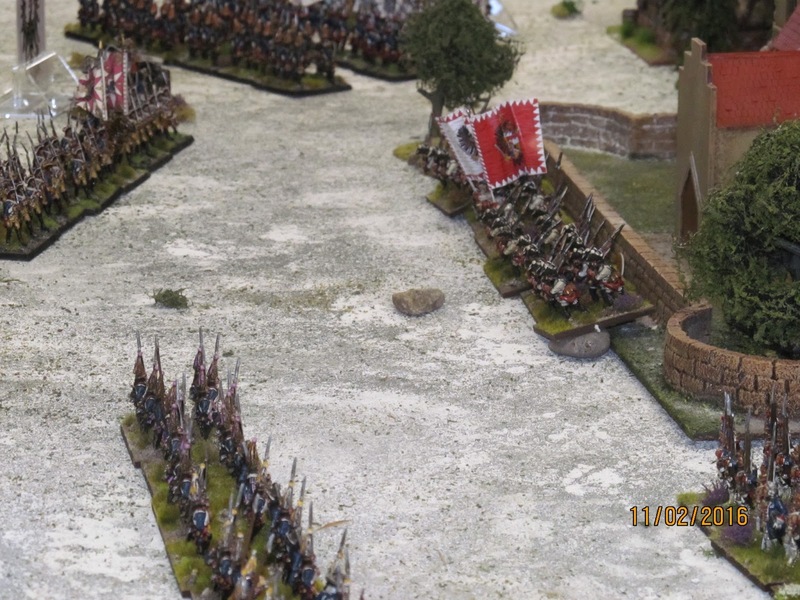 The remaining Austrian infantry on this flank were also driven off, leaving a large gap in the line with nothing to fill it. 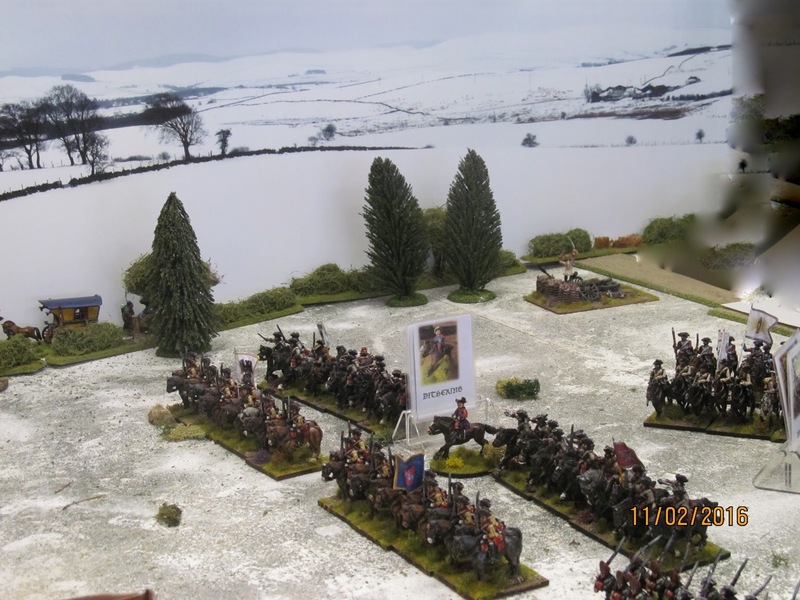 The cavalry fight on the Austrian right continues. 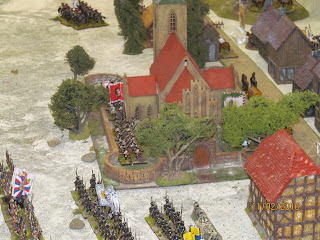 GM Esterhazy can be seen in the red coat just before his demise. 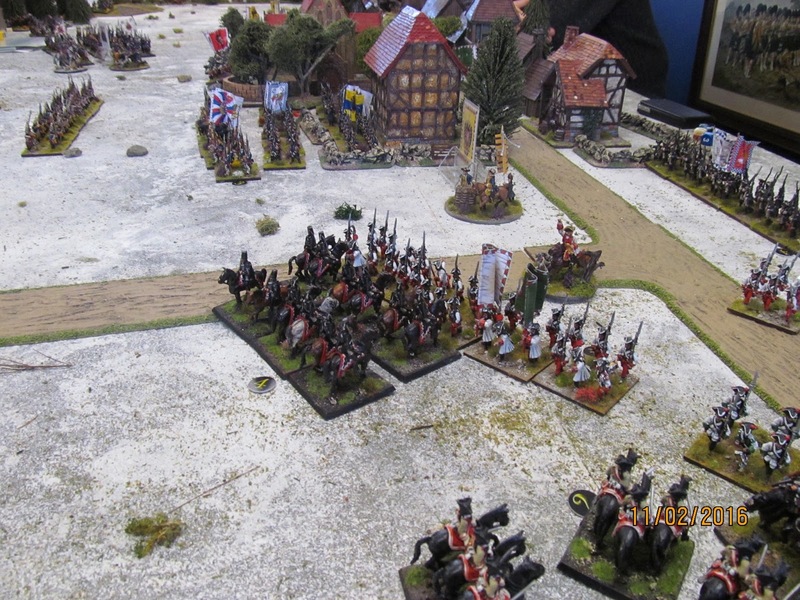 The Prussians gain the upper hand on their left, driving off the Austrians. At this point the Austrians conceded defeat. Their right wing had been bested by the Prussians, and although they had four regiments of cavalry left, they were in no position to make any difference as they were hard pressed by Prussian infantry and artillery fire. The Austrian left was still a force to be reckoned with but only insofar as covering the army's retreat was concerned as the Prussian right flank cuirassiers of Zeithen had now recovered their strength after the earlier mauling they'd received at the hands of Lucchesi and O'Donnell. 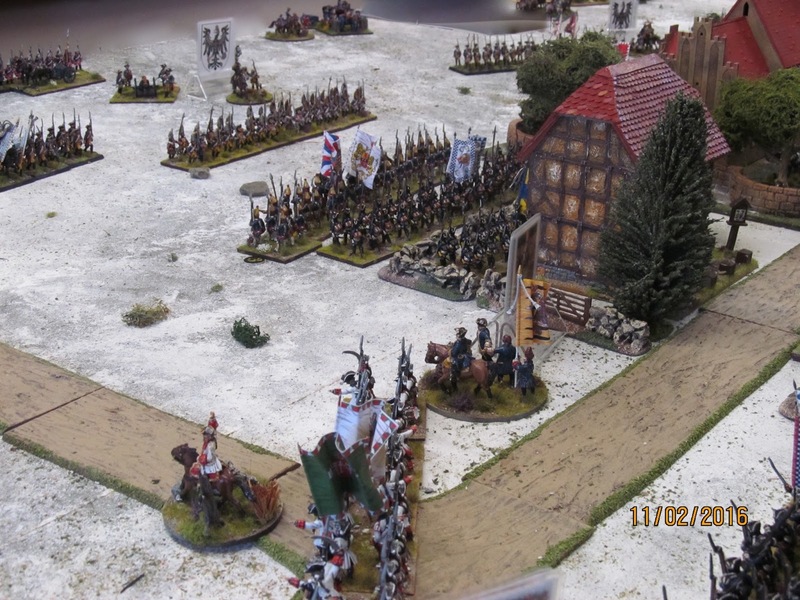 Sadly there was very little Austrian infantry left. The Reichsarmee corps had been disposed of with the exception of a single battalion holding some houses in Leuthen. 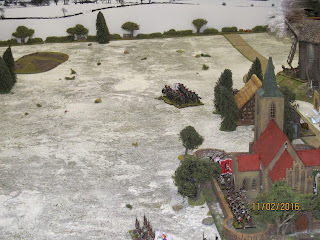 Arenberg's and Khuell's commands had been destroyed in the centre and right flanks so only three or four battalions from Colorado's command were left to face the largely untouched strength of the Prussian main body. 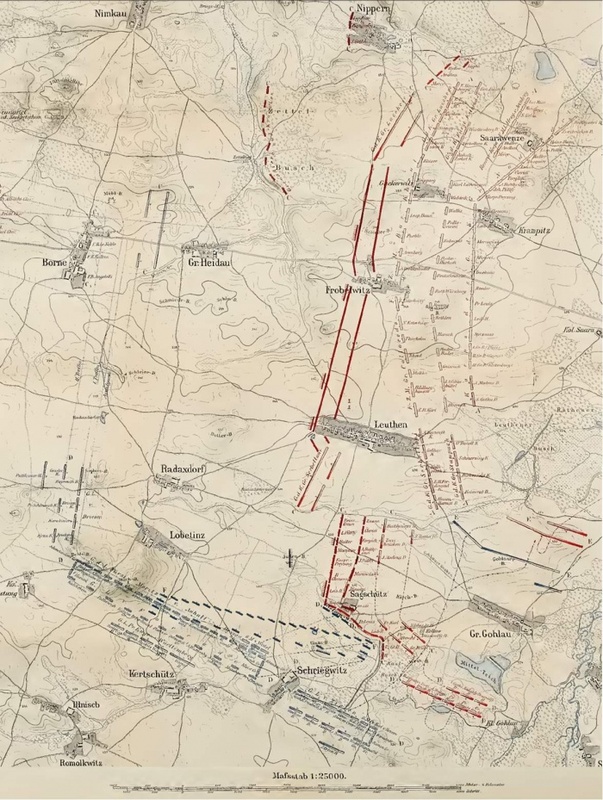 There were simply not enough Austrians left as at least 12 of their units had broken and several more were 'on the brink'. The Prussians had only lost 4 units but now outnumbered the enemy where it mattered, i.e. with Infantry and artillery. It was a very good and satisfying game and the rules worked a treat. Again, the game was far more enjoyable than either of the versions played using Black Powder as there was far more thought involved in deploying and moving units and players are subtly encouraged to adopt the linear tactics of the day. 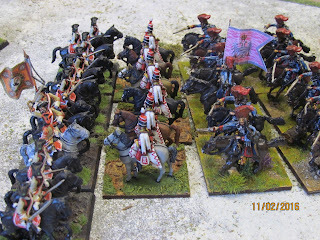 Its interesting that in the two Black Powder games, both were decided by the collapse of the cavalry on each flank. 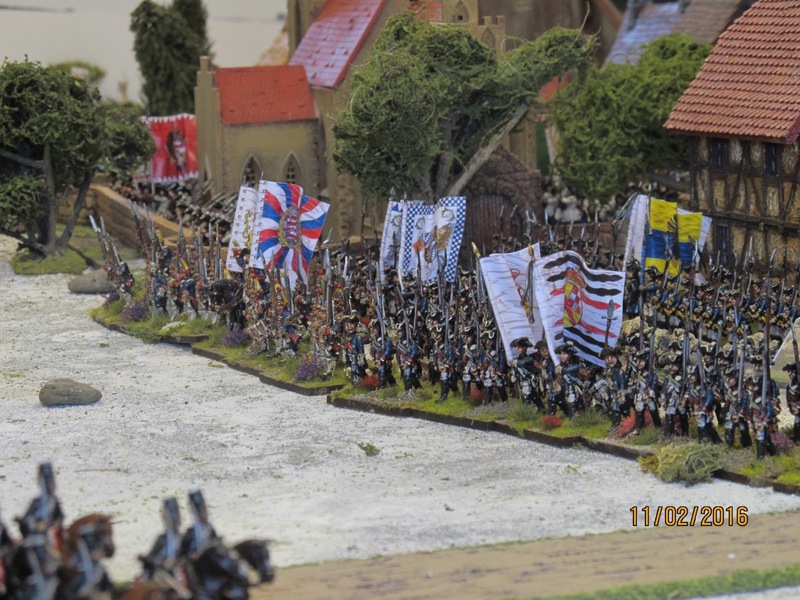 In this game, both sides' cavalry pretty much fought each other to a standstill and it was the infantry and artillery that sealed the Austrian defeat. 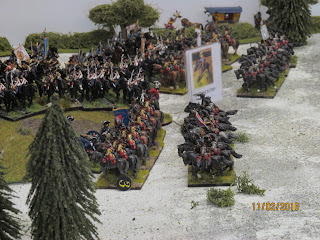 Command and control worked well, and had Robbie not lost two of his key right flank cavalry commanders he may have had the opportunity to wreak havoc on the Prussian centre. Unfortunately with their commanders hors de combat the cavalry was less than enthusiastic about following their 'dithering' replacements. Beautiful armies and great looking game! Thanks for this report, I enjoyed reading the thoughtful account of the game. 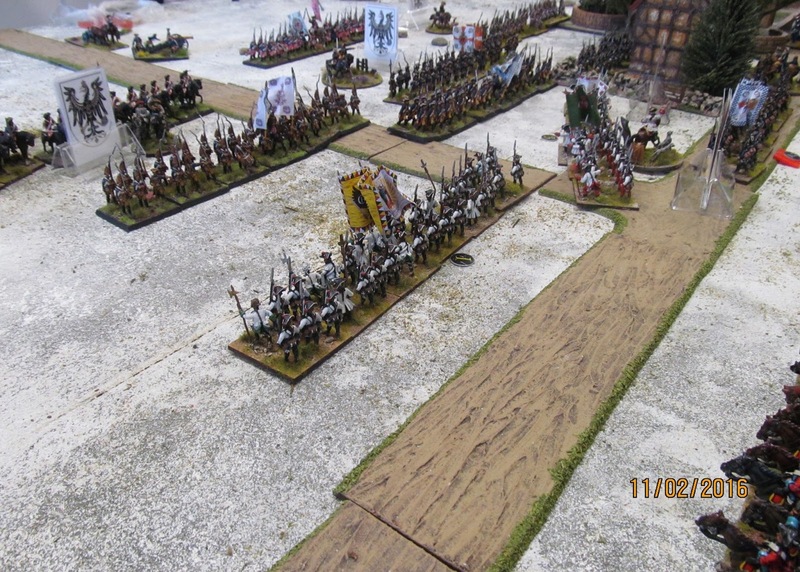 Your terrain and armies are magnificent! You have mentioned before your preference for the Honours of War rule set. I'll look around your site to see if I can find a more specific discussion but I'd like to find out what in particular about them strikes your fancy. Yet again an inspirational report backed up by super photos! Thanks! Great looking game. I need to give HoW a try. Very nice looking game and interesting account. Thank you for your thoughts on HoW. Like Jiminho I'd be interested in reading more on them as I have a set but not used them. The snow is very effective and I note the snow-scene backdrop , very atmospheric. Now that I am finally recovering [albeit slowly] from whatever John the Smoggy passed to me, I thought this was our best refight of Leuthen. The rules, added greatly to the enjoyment? of watching my wonderful leaders shot from their horses and replaced by Corbynesque fools.So thanks for all your efforts. Thanks Robbie. Whatever John the Red Smoggy passed to you found its way to me and I was floored this weekend with dribbling nose, rampant bogies and rebellious sinuses. Yes, it was the best run through so far and as always I get great pleasure out of setting up and putting these games on. I really do like these rules - not that I didn't like Black Powder, but the game plays out better and has a more 18th feel. Anyway, weather and everything permitting its Lignite on Friday if you're free? Colin - another success by the sounds of it. great report and write up.